Product prices and availability are accurate as of 2019-04-10 15:39:46 EDT and are subject to change. Any price and availability information displayed on http://www.amazon.com/ at the time of purchase will apply to the purchase of this product. 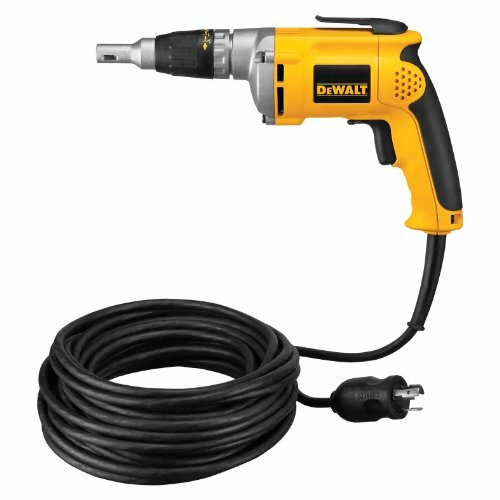 The DeWalt Heavy-Duty Drywall Screwdriver is a powerful yet lightweight tool for heavy-duty, industrial applications, using a 6.3 Amp motor with 0-4000 RPM performance range and 81 inches/pound of torque, all in a light 3-1/10-pound design. With helical-cut, heat-treated steel gears and metal gear housing, this drywall screwdriver is engineered for long life and durability. The depth-sensitive "set and forget" nosepiece ensures consistent results, while the external clutches facilitate easy replacement for maximum tool life. This screwdriver also features a rubber grip ergonomic handle with two-finger trigger for comfortable use, an integrated belt hook, and a 50-foot twist-lock cordset.